These ministries are focused on Jesus’ commands to feed the hungry and give water to the thirsty. The third Sunday of each month, members bring in donations of nonperishable food for Dunedin Cares Food Pantry for distribution to the hungry. This Team prepares bags with lists of needed items for people to shop for and return for blessing on Sunday. This food pantry serves residents of Dunedin, and is located at Faith Lutheran Church, 1620 Pinehurst Road. Donations and volunteers are welcome. We stock our freezer with meals for anyone in need of a nourishing meal, whether it’s a homebound member, a neighbor recovering from surgery, or someone who knocks on the church door. 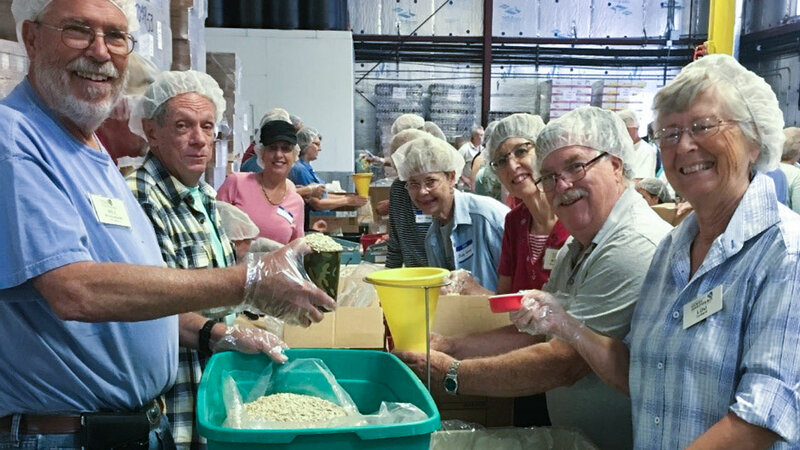 This ministry feeds local people by collaborating with a non-profit organization to hold an annual meal packing event involving parishioners of local Episcopal churches. During the school year this Team supplies healthy snacks to local elementary school children who would otherwise have nothing to eat over a weekend. Members of the church donate funds or shop for the food, and Team members pack it.